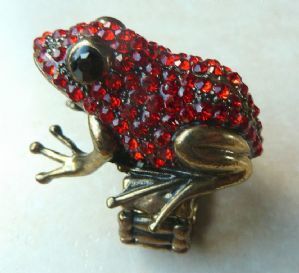 Red frog rhinestone ring that sits ' hoppily ' on your finger. Stretch to fit ring. This is a quirky, unusual red rhinestone studded ring. The ring design features a red frog that sits ' hoppily ' on your finger. The ring is large reaching to approx the first knuckle. It's a striking modern piece in excellent condition. The ring has an adjustable stretch back and will fit most fingers. Decorated with red rhinestones, black ones for its eyes, set in bronze tone metal. 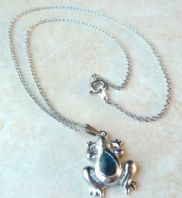 Small frog pendant with abalone shell inlay with a silver tone necklace chain.